When I was in junior high school, I picked up a paperback novelization of Spider-Man tales. For a book report, I was able to convince my English teacher that there was, in fact, appropriate educational content in this book that would enable me to write the required essay. I was adamant that as an eight grader, I could learn just as much from Spider-Man and Peter Parker as I could learn from Tom Sawyer and Huck Finn. So that’s why I was interested in the direction of Amazing Spider-Man #661 and #662, which pairs Spidey up with the young Avengers Academy. ASM #661 and #662 give the power of the pen to Christos Gage, giving usual writer Dan Slott a few issues off. 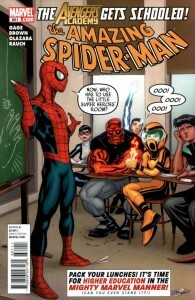 And while these next two issues of ASM are the comic book equivalent of a television bottle episode – a bit of a self-contained placeholder between the recent Spidey in the Fantastic Four arc and the upcoming mega Marvel event “Spider Island” – I honestly appreciated how Gage and Marvel chose to emphasize Spider-Man the teacher, in addition to Spider-Man the superhero in these two issues. “You’re training teen super heroes? 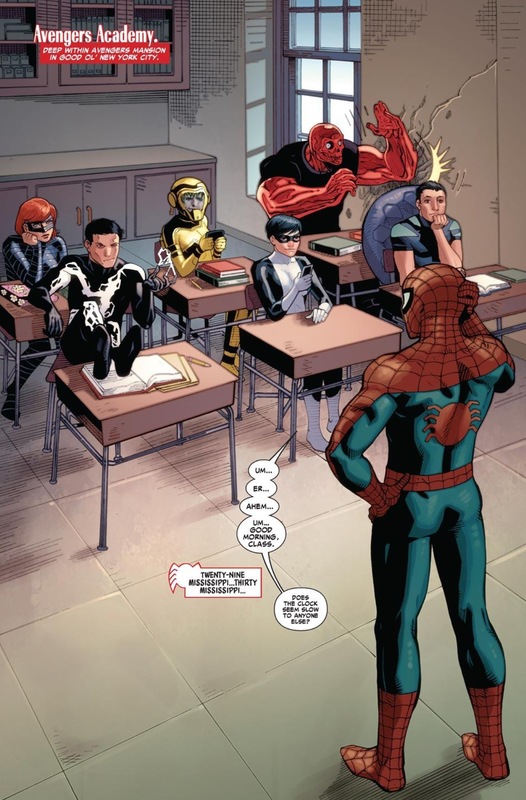 I was the original teenage super hero,” Spidey tells Giant-Man, whose looking for a substitute teacher for these young Avengers in training. “You’re the ideal choice! These are at-risk kids and you’ve already made virtually every mistake a young hero possibly could,” Giant-Man responds. And truer words have never been spoken about the Spider-Man character. There has always been a great emphasis on the value of education in Amazing Spider-Man. Remember, Peter Parker is a brilliant young scientist when he is bitten by that radioactive spider. And while he makes money selling his photographs to the Daily Bugle, the reader is constantly reminded about Peter’s scientific brilliance, even during the contemporary era where he actually was a professional high school teacher. But while Peter is utterly brilliant, he has also made mistakes and poor choices throughout his entire career, going back to Spidey’s origin tale where he is taught “with great power comes great responsibility.” But it’s Peter’s/Spidey’s mistakes that make him more human and relatable. When he first becomes Spider-Man, Peter is all by 16 or 17-years-old. If he was an infallible hero, it would have been unrealistic. It’s during those high school and college years where teenagers and young adults are discovering who they truly are as people. Mistakes have to be made in order to make that discovery. And since Peter has seemingly been locked into his late 20s, early 30s by Marvel, he’s still at that point where, despite having learned plenty of life lessons, he’s still making mistakes. So who better to be a substitute teacher to a young up-and-coming batch of super heroes? Of course in typical “Spidey still makes mistakes” fashion, things go horribly wrong when a somewhat dispirited Spider-Man decides the best course of education is to get these kids out of the classroom and out on the street (we get a good life before this when he repeated the “with great power” mantra and the kids replay that he stole it from Giant-Man). 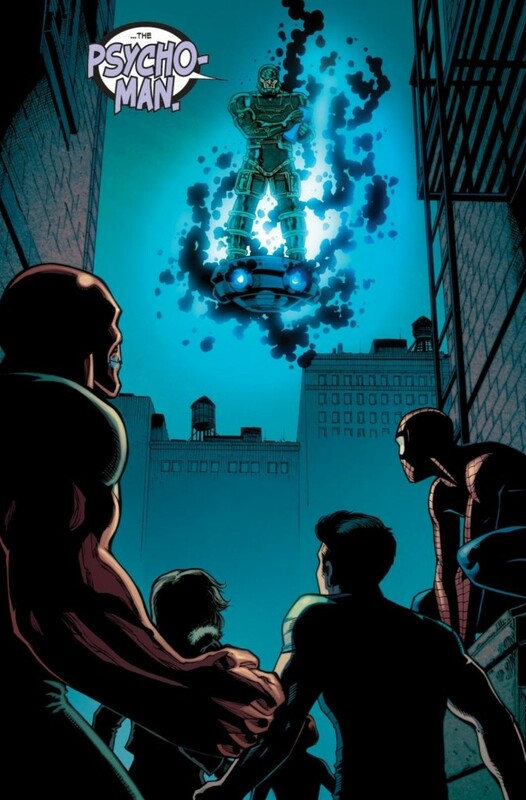 On the streets, the group runs into Pyscho-Man, who uses mind control abilities to instill doubt and fear into the children, who are still too emotionally unstable to combat these psychic powers. 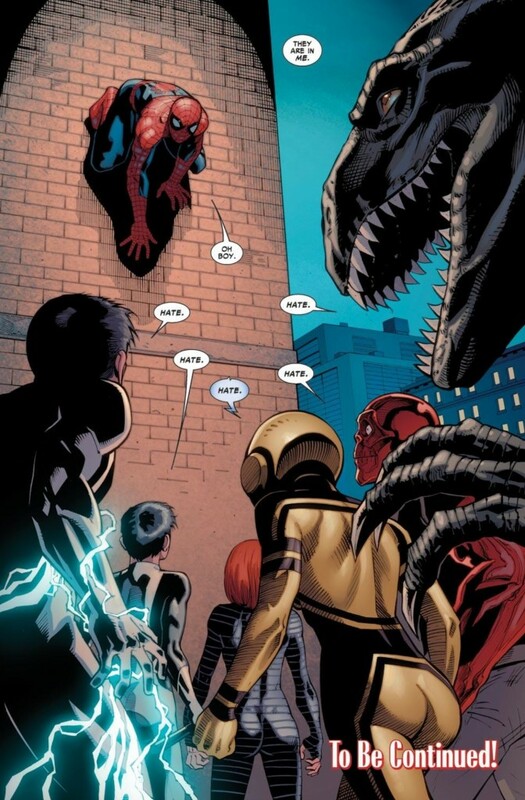 All hell breaks loose and we are left with an appropriate cliffhanger: did Spidey overstep his boundaries and run too big of a risk bringing these kids out of the sheltered educational environment? Read ASM #662 to find out! But in all seriousness, for what is in truth a bit of a throwaway issue for ASM, we at least get a decent exploration into the roots of this character. Of course, for the last five or six issues, between the Fantastic Four crossovers and now this arc with the Avengers, Marvel seems to be moving away from the core base of the Spider-Man universe and turning its flagship title into more of a Marvel Team-Up replacement, but I’m assuming that’s set to change in a major way once the creative team is in full Spider Island mode in few more weeks.